Basford United take on third placed Farsley Celtic away at Newlands on Saturday and will be looking to bounce back from Monday night’s disappointing defeat against Buxton. Both teams are on a run of four wins in their last five league games. Farsley have only lost once at home all season when Hednesford Town took all three points home with a 2-1 win in late August hence Martin Carruthers expects a difficult match: “We know this will be our toughest test of the season. 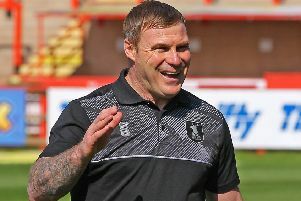 “They have quality in abundance all over the pitch and they are serious contenders for automatic promotion this season. “Like ourselves they have recently beaten Conference North opposition Alfreton and are also in the 1st round proper of the FA Trophy on the 15th. “They will be favourites for this game and I am sure they will be looking to avenge the defeat at our place earlier in the season when they led 3-1 at half-time only for us to come back and win that game 4-3.